Blessings to each and everyone of you! Thank you for your faithful and continuing prayers and support. We recognize that we could not be here without your loving support.“Missions is nothing less than an organized revolutionary assault on the unseen forces of the present darkness by a spiritual legion of soldiers who fight for the extension of God’s kingdom to dominate the Universe. And local churches are the bastions that defend that cause, forge the weapons, train the soldiers, and populate the ranks with men and women bent on spreading God’s fame, or die trying.” (Clint Archer in Missionaries: A Unique Breed , emphases mine). Since I wrote you last week we have had a few new developments which are exciting and I believe Christ-honoring. 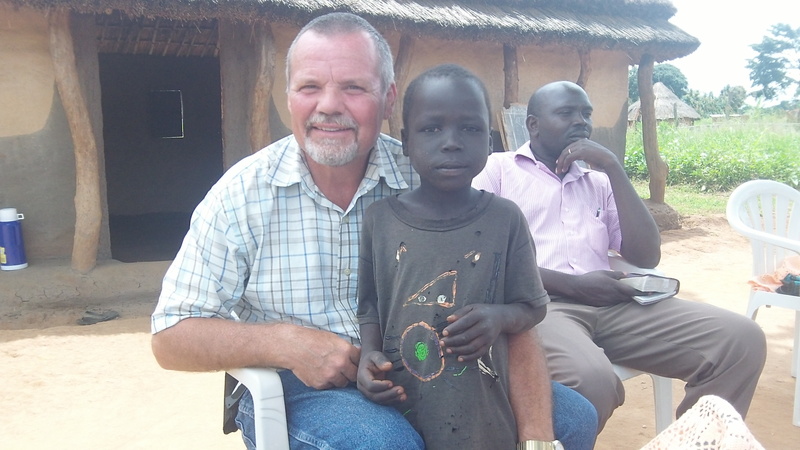 Our mission’s name, Reaching Africa’s Unreached, encapsulates our primary calling. Our goal is to come alongside and support evangelical churches (the term used here is “born again churches”) in our area through discipleship training helping them to remain strong in the Lord and to be multiplying congregations. Secondly, we want to locate and specifically target villages, towns,districts, and tribal groups which do not have even one Christ honoring church. I am happy to report we are moving forward on both fronts. In the last week we have identified two nearby communities with no church. In Carol’s last newsletter, she shared about Obongi which just has a few new believers in it. There is a strong village church in Otobonga about 4 miles from Obongi which was planted in the latter months of 2009 and is pastored by a dear brother named Bosco. Abraham has a strong working relationship with this church and I have ministered there on a number of occasions. 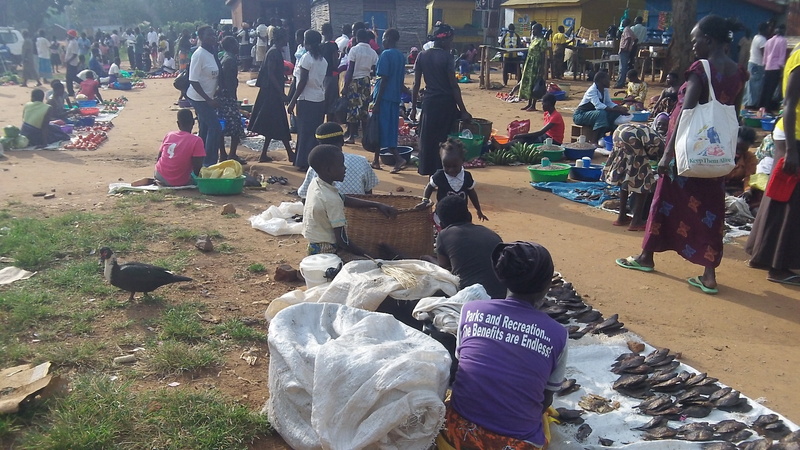 Through the joint efforts of Otobonga church, Abraham, and others there are now a few believers who live in Obongi. Our goal is to see a vibrant church planted in Obongi to be a witness there and which would also work with Pastor Bosco and RAU to plant churches in the many villages near Obongi with no church. Obongi is a Muslim dominated area. 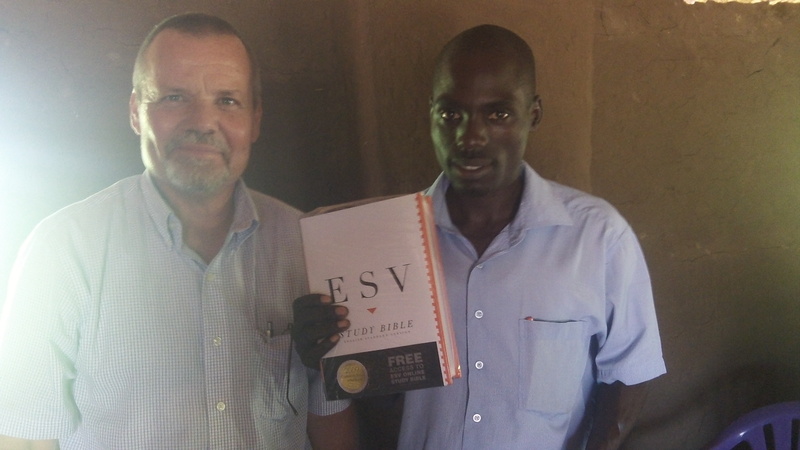 Pastor Bosco receiving a ESV Study Bible and several Christian books. This past Sunday Carol, Sam, and I had a wonderful time with Moyo Town Baptist Church. Many, if not most, of the members of that congregation are Dinkas, so the translation of my sermon was English into Ma’di and then English into Dinka. Many Dinka’s came to the Moyo during the war in southern Sudan. This congregation loves Jesus! After the service we had a nice lunch with the pastor and associate pastor. At one point our discussion turned to neighboring Yumbe District which is over 80% Muslim (Yumbe). There are a few churches in the district. In 2004 two American medical missionaries and one of their Ugandan students were killed outside Yumbe. From that point on in our discussion my heart burned to see churches planted in Yumbe town. Yumbe town (Obongi is somewhat smaller) has approximately 35,000 people in it . 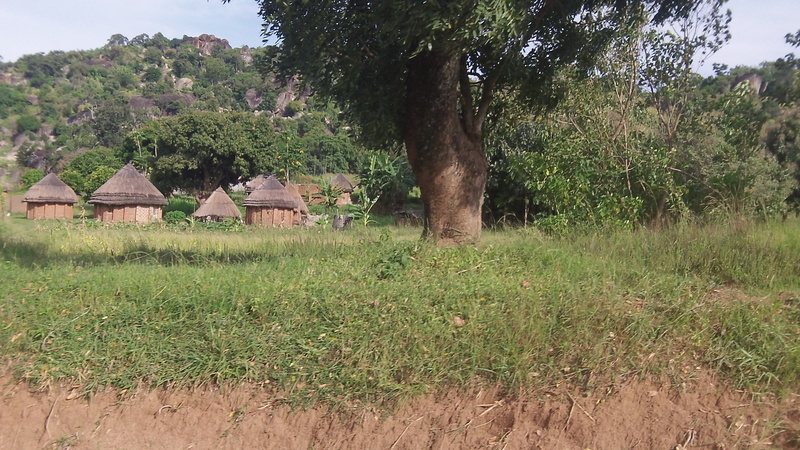 Both Yumbe and Obongi are about a two hour drive away from us when the dirt roads are dry. We believe the Lord has given us a strategy to reach these communities and others like them. 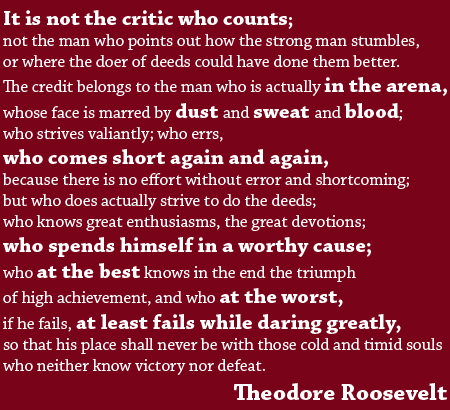 It has been my experience that in a room with, lets say, 10 people there are usually 8 or 9 who say something can’t be done and will lay out a multitude of reasons (excuses) why it can’t be done. Then there are those one or two who state it can be done and who lay out a strategy of how it can be done. A good biblical example of this is when the 12 spies were sent into the land of Canaan and only Joshua and Caleb supported the task given by God, in their case, to take over a land filled with “giants”. They said it could be done because it was ordained of God! 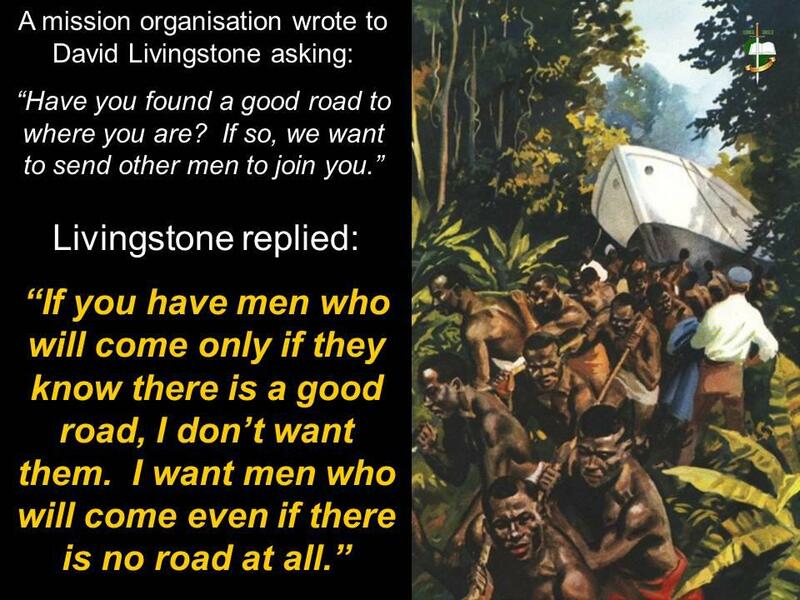 I see great parallels of this with Christ’s Great Commission given to us. Some of the “reasons” given as to why there are no churches in Yumbe and Obongi are: 1.”It is a very difficult area” 2. “They are dominated by Muslims”. 3. “The Muslims will not let you do it!”. Christ says “Go”! Is that not enough for us? Please stand and pray with us as we seek to plant churches in Obongi and Yumbe! Our strategy to reach Yumbe and Obongi , as well as other unreached areas and tribes, includes bringing local missionary candidates (preferably those who are from the targeted area and who know the local language already) here to RAU for intensive, one-on-one discipleship for about 6 weeks and who then, at the end of their training, would go and live among the the targeted group with the intended purpose of being shepherds in a newly planted church. We would work together with the pastor in evangelism and discipleship. RAU would also give some financial help with the understanding that the financial help would not be given indefinitely, but only until the church could be self-supporting. We have such men in the pipeline. Please be in serious prayer for Obongi and Yumbe. There are strongholds of the enemy there which must be broken by intercession and proclamation of the gospel! Godfrey, the young man Carol told you about, is moving into one of our unfinished tukalus on the 26th of September and has already begun his biblical study assignments. He is very familiar with Obongi and has a willing heart to be in there. He has left a well paying job. Two other brothers are possibilities for Yumbe. They both speak Lubara which is the main language of Yumbe district. They, too, would stay in our tukalu’s as well. I look forward to studying the Word with all whom the Lord sends our way! Please pray that the Lord would raise up others for the many other unreached areas that do not have the gospel and will not have it unless someone physically goes to them and are willing to live with them to help establish a Christ-exalting, local church. Where there is a Christ-honoring local church the orphan and widow will be cared, the suffering and needy will be given lasting and Christ-honoring love, oppression will be resisted, and, most importantly, the living and true God will be worshiped in Spirit and in truth! The children are so precious. May they be raised in the fear and admonition of the Lord! I know that because of your active and prayerful support I am “preaching to the choir”. Thank you so much for your on-going help and intercession! Together with you we are “laying up treasures in heaven”! I just had another triple bunker bed and single bed made, so slowly by slowly we are getting RAU ready for guests and teaching retreats. Our first large group will be here the week of October 20th. It looks like we will have 15-18 pastors. Ron Zeiner, a good friend and former missionary to South Africa will be our main teacher. His primary topic is Ezra-Nehemiah and Principles of Leadership. We have a lot to accomplish to be ready for this first group. We also have several other teams which will be coming in November. Pray for these times of discipleship and ministry and for the funds needed to get the RAU facilities in a position serve in a Christ honoring way (see below). Please also pray for the safe arrival of the ’99 Land Cruiser on its way from Japan and the container from Texas. Thank you! There is a short and powerful video posted here of William Booth’s vision of the lost perishing without the gospel. 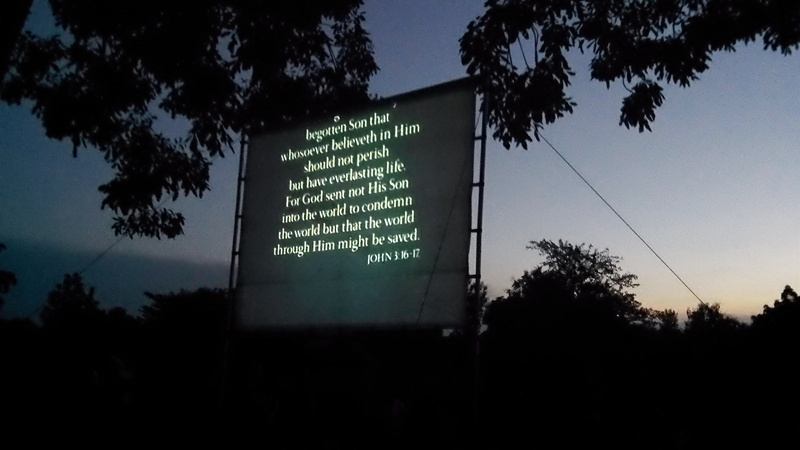 The video exemplifies God’s call given to each and every follower of Christ Jesus. Let us shake off our complacency and set our eyes upon Jesus lifted up and seated at the right hand of God. Surely as our eyes are opened to see Him who died for our sins the the things of this world which we are chasing and living for will be seen as trite as they really are! There is also a 32 minute message posted here by John Piper on missions which is very encouraging. It is one of my all time favorites! You too will be encouraged in your pursuit to be obedient to Jesus mission (John 20:21)! May the Lord bless you and keep you and make His face shine upon and be gracious to you! Below are the start-up projects we are hoping to finish so that we may move ahead in the desired aim of training. Please pray for their completion and consider giving to help finish them. 1. Finishing up the refurbishing of our four existing tukaloos on the land. The four have now been roofed with new grass. The the doors and windows are finished. To plaster them and do some repairs on their foundations will require an additional $400. 2. $1000 to dig a new double stall pit latrine for the tukaloo quarters with an outdoor bathing facility. The existing pit latrine is about to cave in and there is no place to bath. 3. $4,000 for an outdoor kitchen and attached living quarters (one small room and bathroom) for Lucy, our cook/helper. The current one is about to fall down and is some distance from the Guesthouse. As stated in an earlier newsletters we need an outdoor kitchen to be able to cook for large groups with wood and charcoal. To get propane gas for our indoor stove is hard to obtain and expensive. It also opens up the room Lucy is now staying in for guests. 4. The pouring of a beams to set the container on when it arrives in November: $300+-. Provided! 5. Upfront furnishings to host groups (beds,mattress,mosquito nets etc): $550+- and $900 for remaining shelving/furniture in Guesthouse. 6. Tile on our wrap-around veranda to create an extra barrier between the Guesthouse and snakes! It would also make it easier to clean. We would have to bring the tile up from Kampala. The estimation to do this is $3000+-.$3000 has been provided! PTL!! 7. The building of 4-5 more tukaloos to house pastors/evangelists/church planters for discipleship. Each tukalu can take care of 4-5 people and they are inexpensive to build. To build one tukaloo is around $500. Tax deductible charitable donations may be made via PayPal. PayPal also has a way to make reoccurring monthly gifts. To do so please click their link below. PayPal deducts a small amount from each gift as a processing fee. All gifts given through PayPal are now tax deductible as Reaching Africa’s Unreached has 501 c3 tax exempt status as a charitable organazation. If you wish to write a check you may write it out to R.A.U. and mail it to Lifegate Missions, 395 Lifegate Ln., Seguin Texas 78155.